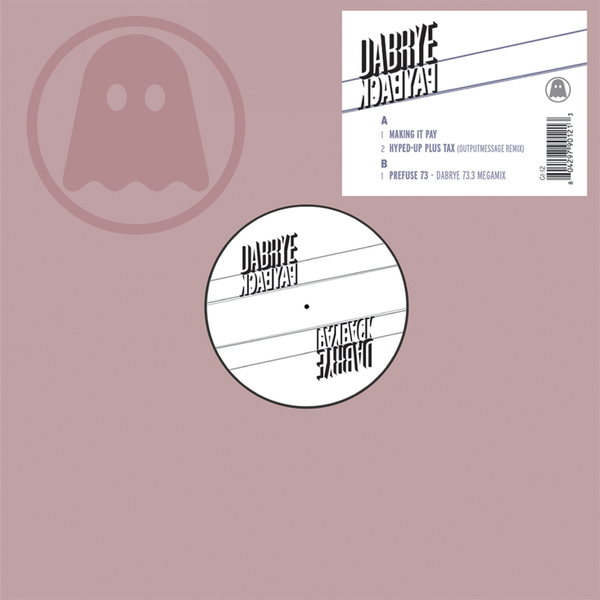 Tadd Mullinix's Dabrye project has managed to totally distinguish itself from the rest of the instrumental beats brigade with a sound that's instantly recognisable as its own. Even more remarkably, that sound has been perfected across only a couple of releases, one for Ghostly, and one for Scott Herren's ace Eastern Developments imprint. 'Payback', therefore, reaches us amid much anticipation and an eagerness to delve deeper into the Dabrye sound, a crunchy electrosizzle interpretation of hop hop beat standards, and a deliciously neon-lit ability to set the scene. 'Making it Pay' opens the EP with that same delicious beat shuffle, this time accompanied by a glorious filtered, chopped-up and lovingly arranged female disco chorus, a metallic edge imbuing proceedings with the crunchy air that Dabrye has mastered so effortlessly. The Outputmessage Remix of 'Hyped-Up Plus Tax' is up next, taking a bare-thread skeleton of melody from the original and wrapping it up in a fleece of reverberation and ethereal stretch, hip hop beat in tow, of course. The flipside is taken-up in its entirety with an ace Prefuse 73 megamix, in which one master of the genre tackles the work of another with suitable respect, while one Dabrye hit seamlessly slips into another, the odd cutup stutter lending itself for some excitement along the way. Excellent stuff once again, will be interesting to see where the Dabrye sound goes from here.